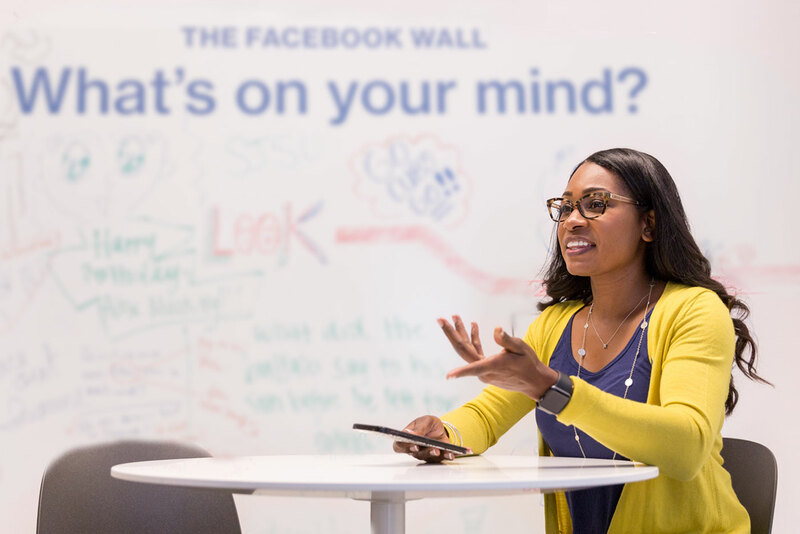 Strolling through Facebook’s Menlo Park campus, Netta Conyers-Haynes passes a café stocked with coffee and fruit, gestures to conference rooms named after 1980s movies and stops before a wall-turned-whiteboard covered in doodles. As Facebook’s head of internal communications for North America, Conyers-Haynes, ’07 Public Relations, values every word. Conyers-Haynes specializes in promoting positive culture at work and beyond, a likely result of attending 13 different schools before 10th grade. Though it was difficult to be uprooted, the constant cultural shifts taught her to adapt, relate to others and pursue her goals. A self-supported college student, she’d had to work through her San Jose State commencement ceremony. Ten years later, she delivered the convocation address to the class of 2017 at the African-American Convocation. Touched by the students’ passion for social justice, she refers to it as “her” graduation, an opportunity to launch a new generation.